What is the one area of investing where you think anyone could have made money in the last year? If you're like us you probably thought commodities. However, earlier today, Bloomberg News reported that in the month of July, commodity hedge funds posted a record monthly loss of 11.8%. Over the same time frame, the CRB index was up 98 bps after rebounding late in the month from a mid-month swoon. One commentator attributed the woeful underperformance to the fact that volatility in commodity prices made it “harder to capture long-term trends”. We’ll leave it up to you to figure out what that statement means, but aren’t hedge fund managers supposed to be active managers, rather than buy and hold? 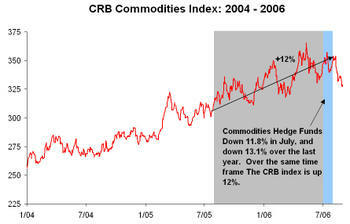 After looking at the chart of the CRB index, something tells us August wasn't much better. From Bloomberg we found this nice table breaking down equity strategists' recommended portfolio allocations as well as their price targets for the DJIA and the S&P 500. Index forecasts are for the end of 2006. The overall averages point to a gain of another 300 points on the Dow and 40 points on the S&P 500. 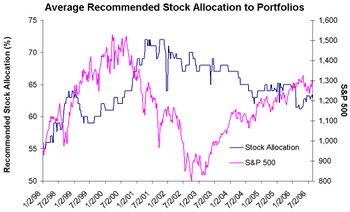 We have also updated our historical chart of the recommended stock allocation going back to 1998. We thought the chart below was interesting. 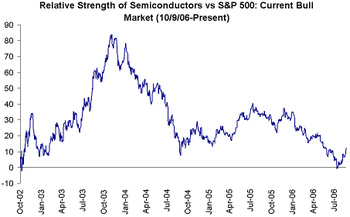 It shows the relative strength of the semiconductor group versus the S&P 500 since the start of the bull market. Just when the group fell inline with the index, it made a nice bounce and has had a pretty good run in the last month. There's slow posting today as we work on our monthly Newsletter scheduled to go out this evening. Have a great day! Pepsi (PEP) is currently trading 2.92% above the top of its trading range. In the last year and a half, the stock has been more overbought 4 times. Below we list the short-term price reactions when the stock has been this overbought. As shown, there is a negative bias on the day and week following times when the stock has reached these price levels. 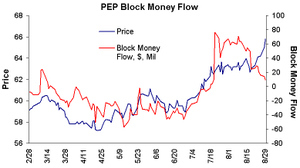 We are also noticing some block selling in the money flows on the stock (as shown below). For more info on money flows you can click here. The information herein was obtained from sources which Birinyi Associates, Inc. believes reliable, but we do not guarantee its accuracy. None of the information, advertisements, website links, or any opinions expressed constitutes a solicitation of the purchase or sale of any securities or commodities. Please note that Birinyi Associates, Inc. or its principals may already have invested or may from time to time invest in securities that are recommended or otherwise covered on this website. Neither Birinyi Associates, Inc. nor its principals intend to disclose the extent of any current holdings or future transactions with respect to any particular security. You should consider this possibility before investing in any security based upon statements and information contained in any report, post, comment or recommendation you receive from us. Is The Market Getting Over Options Backdating? During the latest reporting period for quarterly earnings, it seemed as though any mention of stock options in an earnings release or conference call, no matter how good the earnings report was, caused the stock to drop. Shoot first ask questions later, was the rule of the Summer. Markets sold off this morning after the Consumer Confidence report released at 10 am showed a month over month drop of 6.92%. 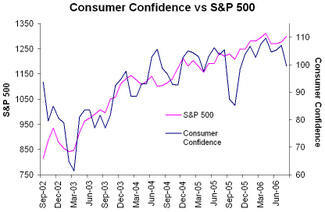 Below is a chart of Consumer Confidence vs the S&P 500 since the start of the bull market. 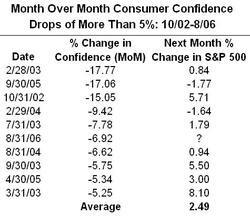 There have been five larger drops since October of 2002, and the S&P went up the following month 3 of the 5 times. The average gain of the index in months following Confidence drops of 5% or more is 2.49%. 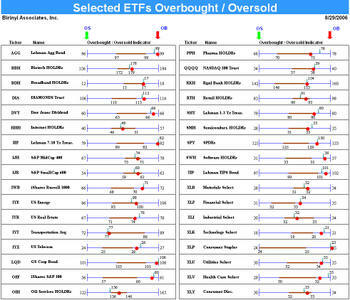 Below is a list of active ETFs run through our overbought/oversold screen. Please check out the key first to understand what everything means. The purpose of the screen is to be able to quickly tell where indices, sectors, asset classes, etc... are currently trading based off of their normal trading ranges. As shown, fixed income ETFs are currently overbought and are approaching the most overbought they have been in the last year and a half. Staples, health care, dividend stocks, and the spyders remain overbought, while transports and oils are at the bottom of their ranges. Internet stocks and semis have also made a nice comeback in recent sessions as well. 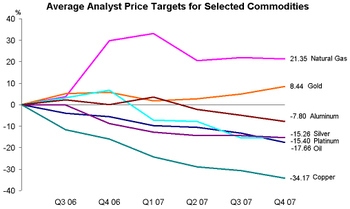 Below is a chart highlighting the average analysts' price target for selected commodities by quarter through the end of 2007. The expectations are in percentage terms in order to compare the commodities. The number next to each commodity is the percentage difference between the expected price in the last quarter of 2007 and the current price. Interestingly, oil is expected to decline steadily to -17.66% by the end of 2007 while natural gas is expected to climb 21.35%. Gold is also expected to rise 8.44% while silver and platinum are expected to decline over 15%. Something just doesn't seem to add up there. Expectations for copper are the grimmest at -34.17%. Amazon.com (AMZN) is trading up 3.2% today after announcing a $500 mln share buyback, but upon closer inspection this financial decision ranks right up there with how the company used to spend $1.10 for every $1.00 of revenue. With the stock trading at a current P/E ratio of nearly 40, its earnings yield is a meager 2.5%. This compares to a US 10-Year Treasury that currently pays 4.8% on an annual basis. As the following very basic example assumes, AMZN would be better off just putting the money in some investment grade corporate bonds. We realize this example makes a lot of assumptions, but it still illustrates that shareholders would be better served if AMZN opted to put the $500 mln to some other use. Let’s assume that AMZN has $500 mln lying around burning a hole in its pocket. If they take that $500 mln and actually buy back stock, the share count will decrease by 17.2 mln shares. If earnings over the next four quarters were to equal earnings over the last four quarters, the earnings per share would increase from $0.74 to $0.77 due to the lower share count. Now let’s assume that AMZN takes that $500 mln and decides to invest the money in investment grade corporate bonds. With investment grade bonds currently yielding 97 basis points above the 10-Year, AMZN would pick up a yield of 5.77%, which translates into $28.85 mln. Again, if we assume that earnings remain the same, spreading that $28.85 mln across the 419 mln shares would increase EPS by $0.07 from $0.74 to $0.81 per share! Which choice makes more sense to you?